ABC has done the right thing and renewed Agent Carter for a second season. This is all we really wanted from the giant pile of renewal announcements we’ve gotten so far. This means that next year’s schedule could have Agents of SHIELD, Agent Carter, the Agents of SHIELD spinoff (featuring Mockingbird and Lance Hunter), and the super-secret Marvel superhero show on it. Although, Deadline says that ABC has put the spinoff on hold, leaving Bobbi Morse and Lance Hunter on Agents of SHIELD rather than on their own. Which makes sense, since four Marvel shows does sound like just too much. 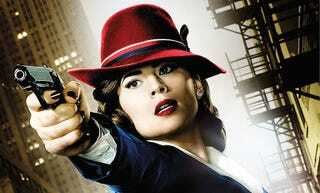 As for what a second season of Agent Carter will look like, Showrunner Tara Butters has said that the plans for a second season include staying at eight episodes — possibly thirteen, but there’s a worry that the show needs too many special effects for thirteen episodes to be pulled off at high quality — and that they’d move Peggy to Hollywood or Europe. In addition to Agent Carter, ABC also renewed Once Upon a Time and the medieval musical comedy Galavant.